In Slovenia, final users have at their disposal only around 70 % of primary energy. The efficiency of electricity and heat production mostly influences this share. Higher electricity consumption also has an influence on higher losses. Statistical Office of the RS, 2009; Jožef Stefan Institute, 2009. Statistical Office of the RS, 2009; Environmental Agency of the RS, 2009. Final consumption only has a part of the energy consumed in Slovenia at its disposal, due to losses in the energy system (especially in electricity and heat production and their transfer). The scope of these losses is a significant indicator of the impact of the energy system on the environment, since fossil fuels still represent a significant share in consumption. In 2008, the losses in electricity and heat conversion and transfer represented 28.9 % of the total energy consumption in Slovenia (primary energy). In comparison with 2000, their share increased by 0.6 percentage points. The following factors influence these losses: the efficiency of electricity and heat production, own consumption of power plants and consumption in the energy sector (mines, refineries, compressor stations, etc.) and losses in networks. Electricity and heat production and conversion contribute the largest share to losses. In 2008, these losses amounted to 26.1 % of primary energy; in 2008, they amounted to 25.4 %. In the period 2000–2008, significant fluctuations were recorded; these shares were between 25.4 % and 28.0 %. The losses are directly connected to the efficiency of electricity and heat production, which is dependent on the efficiency of conversion in thermal power plants and thermal power and heating plants (in 2008, the latter was 0.4 percentage points higher than in 2000), the share of their energy consumption in total energy consumption in conversion, the share of energy consumption in the nuclear power plant (with a constant efficiency of 33 %) and in hydroelectric power plants (with a constant efficiency of 100 %) and the efficiency of heat production in heating plants and their share of energy consumption. The average efficiency of electricity and heat production in Slovenia in 2008 amounted to 44.7 %. The highest was in the year 2000, when the share of electricity from hydroelectric power plants was the highest and the share from the nuclear power plant the lowest; in 2000, heat production in heating plants was the most efficient. Own energy consumption in electricity and heat production and consumption in the energy sector in 2008 represented 1.6 % of primary energy. This is the highest share in the period 2000–2008, where the range was from 1.4 to 1.6 %. The energy sector is composed of the following branches: electricity, heat and gas supply (E according to the NACE 2002 classification), the production of coke, oil derivatives and nuclear fuel and the production of energy raw materials. 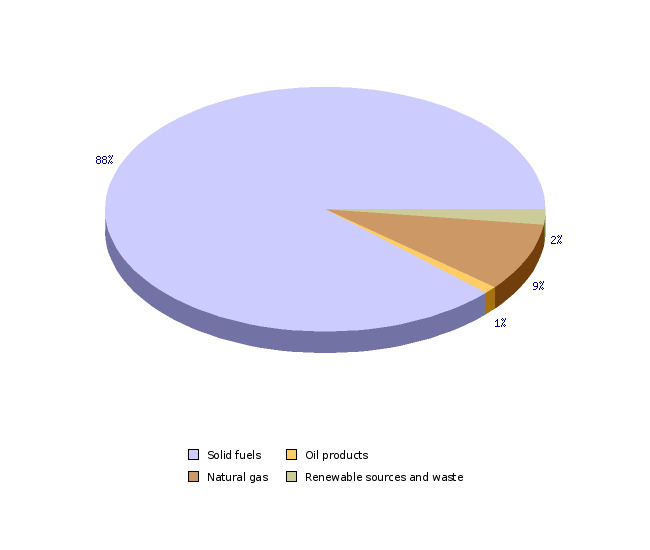 Own production represents almost 80 % of energy consumption in this item, inside of which a large part is contributed by own electricity consumption (95 %). In own electricity consumption, there is a big difference between different types of power plants. In thermal power plants, own consumption represents more than 11 % of gross electricity; in the nuclear power plant this is less than 5 % and for hydroelectric power plants less than 2 %. In networks in 2008, 1.3 % of primary energy was lost, which is the second lowest value in the period 2000–2008. The values ranged between 1.2 % and 1.7 %. The majority of losses are generated in electricity transfer (69 %). 71.1 % of primary energy remained for final consumption in 2008. 3.0 % was consumed for non-energy purposes. 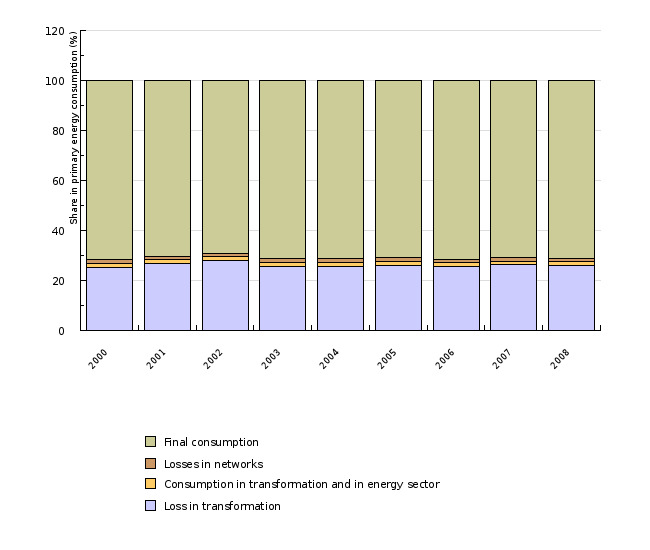 In the EU-27, 70.5 % of primary energy (22.8 % was lost in conversion, 5.2 % due to consumption in the energy sector and 1.5 % due to losses in the network) was available for final consumption in 2005. Luxembourg was the most efficiency country, where 94 % of primary energy was available; Bulgaria was the least efficient, since 48 % of its primary energy was lost (EEA, 2008). In light of CO2 emissions, the consumption of solid fuels mostly pollutes the environment; such consumption strongly prevails in the conversion of energy into electricity and heat. 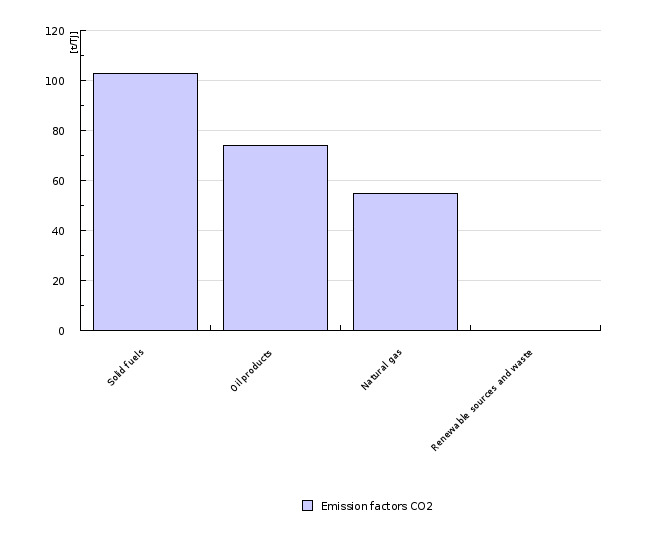 The consumption of natural gas causes the least CO2 emissions among fossil fuels per energy unit. Date of acquisition for this indicator: 9 December 2009.